Potato and onion in a mayonnaise and cream dressing with chive and parsley. Creamy mayonnaise. Seasonally selected potatoes cooked for the ultimate texture. 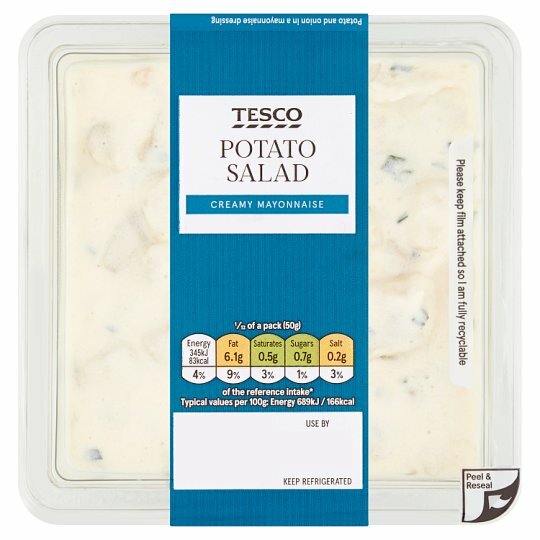 INGREDIENTS: Potato (64%), Rapeseed Oil, Water, Onion (4.5%), Soured Cream (Milk) (2%), Sugar, Pasteurised Egg, Spirit Vinegar, Chive, White Wine Vinegar, Salt, Parsley, Stabilisers (Guar Gum, Xanthan Gum), Acidity Regulator (Sodium Acetate), Mustard Seed. Contains milk, egg and mustard. For allergens, see ingredients in bold.